Summary: It's been three years since the devastating accident . . . three years since Mia walked out of Adam's life forever. My review: I loved Gayle Forman's debut YA novel, If I Stay. Mia's story was heartbreaking, intriguing, melancholy and such a gorgeous read. Forman's prose was powerful and beautiful. There were a few times I had to stop reading because sections were so profoundly moving. With Where She Went, my reading experience was different. I didn't need breaks. All I wanted to do was stay in Adam Wilde's mind, see his world, feel his emotions. The only thing missing was not being able to hear him sing his songs. Forman captured the voice of an emotional young guy, carrying the last three years of his life on his sleeves. Remember the promise he made to Mia at the end of the first book? Of course you do. That promise plays a prominent role in this sequel. Adam Wilde is on a habitual emotional rollercoaster ride. That's his life AM-After Mia. He's broken, depressed, prone to anxiety attacks, smokes, but you wouldn't know it from looking at him. He has become a rock star with two chart topping albums, loads of awards and recognition, girls scream his name and want to sleep with him, and he's living with a hot actress. Adam should be having the ultimate time of his life. He isn't. The album he wrote, Collateral Damage, for his band, Shooting Stars, was created when he was at the lowest part of his life and needed to resurface back into the world. Keeping himself in check is getting increasingly hard and his shaking hands are simply the tremors of the threatening volcano inside of him. Things come to a head for him after an interview goes awry. Needing to get away he takes a walk and winds up looking at Mia--a picture of her in a concert poster. His split second decision to go inside will impact him forever. As much as this novel is Adam's story, Where She Went also continues Mia's story through her surprise meeting with Adam. I enjoyed how she shows Adam her favorite unusual spots in New York City. Music is such an immense force in both their lives and in this book both rock and classical are always present. Their scenes together, along with Adam's alternating chapters from the past, fill in the holes in time so the evening they meet seems continual and smooth. The pacing was steady, I never felt a lag. Adam's voice and his views on everything were convincing and a joy to read. I know a lot of attention has been focused on the film production for the Hunger Games movie franchise, but I think Forman's two novels should be made into movies. Both books are incredibly visual, the dialogue is spot on, and there's that endearing and unforgettable love story. Both movies would have incredible soundtracks too! 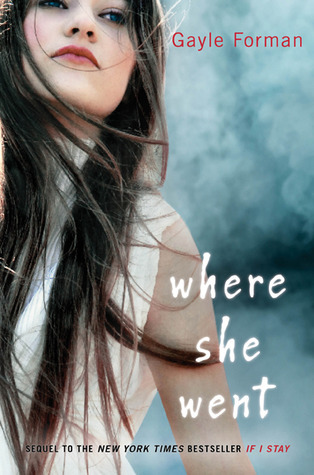 If you loved If I Stay, Where She Went is a must read. Rating: +++++ Buying this one! Favorite excerpt: "I've blamed her for all of this, for leaving, for ruining me. And maybe that was the seed of it, but from that one little seed grew this tumor of a flowering plant. And I'm the one who nurtures it. I water it. I care for it. I nibble from its poison berries. I let it wrap around my neck, choking the air right out of me. I've done that. All to myself. I look at the river. It's like the waves are fifty feet high, snapping at me now, trying to pull me over the bridge into the waters below. Cover comment: I really like the simplicity of the picture and how it captures the gaze in the model's face. I immediately think of Mia. I'm so glad the model isn't wearing some glamorous long gown and either running or staring off at something. So glad to read you liked this one! I know that at one time, this was supposed to be a movie with Catherine Hardwicke directing and Dakota Fanning was looking at playing Mia but then they both dropped the project. I'm not sure if it will be made now or not. Anyways, thanks for the review! I can't wait to read this one. Hahahahahaha! I love your comment about the cover: "I'm so glad the model isn't wearing some glamorous long gown and either running or staring off at something." lol SO TRUE! Fantastic review. I've still got to read the first one, but these stories look fantastic and I can't wait to get around to them. I love the review! I so can't wait to read this. I'm so excited to read Adam's POV after he and Mia broke up. AJ-thanks for the info! I really do hope they still make the movies. KM-lol:) It's amazing, hope you love it too! Chel-keep that excitement going. I think you'll LOVE Adam's POV. Gayle Forman truly is brilliant with If I Stay and now Where She Went. She give us two books that formed one extremely moving, thorough, story. With having had both Mia and Adam's points of views I was able to see all sides of these characters, piecing together the story of their lives and the weight of their love and how it affected them. Gayle concluded Where She Went beautifully, as well as the story of Mia and Adam. Even if it wasn't straight out of a fairy tale.